Rocksprings is a town that sits on top of Edwards Plateau in Edwards County, Texas. The town got its name from the natural Rock Springs that bubble in the area. After the town courthouse burned down, the spelling of Rock Springs was changed to Rocksprings. The Devil’s Sinkhole is seven miles north of town. 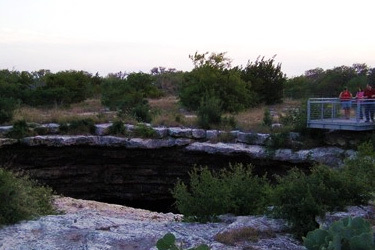 The Devil’s Sinkhole, a natural bat habitat, is home to the Mexican free-tailed bat. The cavern has said to be the largest single-chamber cavern in Texas. At sundown, visitors can witness over 3 million bats emerging from the surface. Hunting is a eminent attraction to Texas Hill Country. The V5 Ranch offers firearm and bow hunters over 2750 acres of hunting. The area contains Black Buck Antelope, Axis, Elk, Whitetail Deer, Fallow deer, Aoudads, and Buffalo. The ranch provides an excellent, contained hunting expedition. Anchor T Heart Exotics is another excellent hunting company. Their hunts include Axis Does, Axis Buck, Hog, Whitetail Deer, Turkey, Black Buck, Red Stag, and Fallow. Guests can purchase from several different hunting packages including guided hunts, semi-guided hunts, day hunts, trophy hunts, and package hunts. Rocksprings holds a “Top-o-the-world” festival each year in hopes of honoring wool and mohair production. The Kingburger Drive Inn is the oldest restaurant in the area. They are well-known for their delicious ice cream, grilled chicken salad, and burgers. Golf enthusiasts can enjoy the privacy of the 9-hole Rocksprings Country Club. The club includes a rental shop, driving range, and practice green. The Devil’s Sinkhole is only 7 miles north of town. Several hunting expeditions and day-trips are offered in the area. The Kingburger Drive Inn is the oldest restaurant in Rocksprings.